Item number Na942 from the MOA: University of British Columbia. Two profile polar bears facing opposite directions. 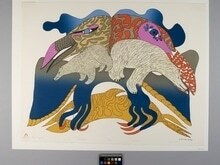 Background consists of stylized limbs, wings, eyes, talons, parts of bodies of birds and fish-like animals. 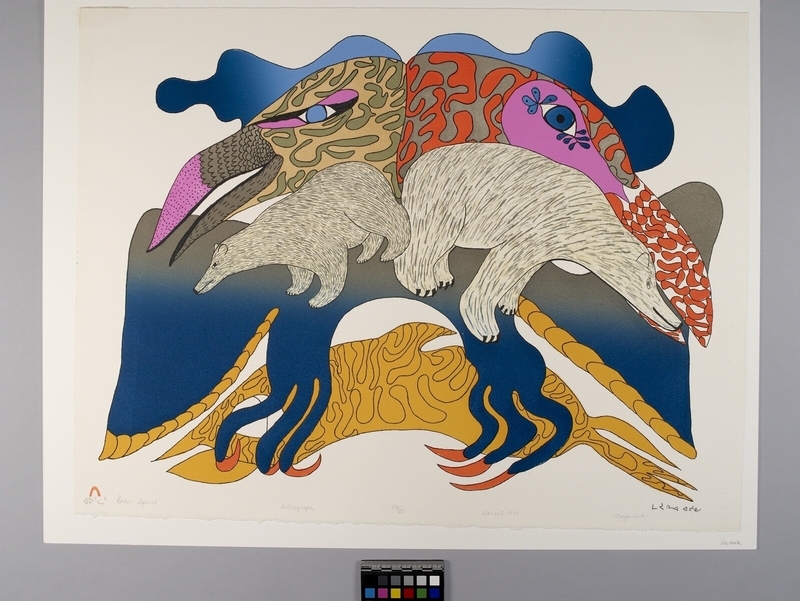 Below image in pencil from side on left: Cape Dorset stylized 'red igloo' seal above name of printmaker in Inuit syllabics, "Bear spirit lithograph 33/50 Dorset 1979 Mayoriak," name of artist in Inuit syllabics. Canadian Eskimo Arts Council's blind embossed stamp in lower corner on right. The print is on horizontally rectangular off-white paper mounted with off-white matboard and framed.